History of Don’t Spray Me! Don’t Spray Me! 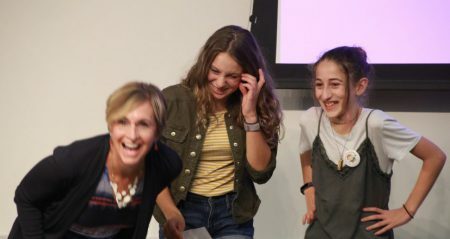 was founded in September 2015 by residents of West Chester PA and surrounding communities to raise awareness about the dangers of pesticides and other chemicals in the environment. 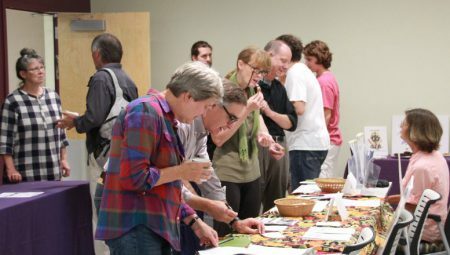 We soon started working within the Sustainability Committee of the Southeastern Pennsylvania Group of the Sierra Club, and then reached out to local groups that share our environmental concerns. Our logo is a baby in a gas mask that was featured in our first yard signs (on the right below) in 2016. We introduced our “Happy Baby” signs (on the left below) in 2017 for those who wish to emphasize that in West Chester and many other locations we had in fact not been sprayed. Our signs symbolize our desire to protect the environment and people, particularly the young, who are most vulnerable from the dangers of chemical poisons. With the support of our mayor at the time, Carolyn Comitta, and our Borough Council, we won our first victory when the threatened spraying of Permanone in the northeast section of West Chester borough was avoided in 2015. Borough officials agreed with us that the small risk of West Nile Virus was not worth risking the health of thousands of borough residents and the associated environmental damage, including the killing of bees and other beneficial insects, the poisoning of run-off water, and the danger to pets. We are now a group of about 250 concerned citizens with teams in West Chester Borough, East Bradford, West Goshen and Westtown working in our neighborhoods on these important environmental issues, and we will be reaching out in other municipalities in 2018. We have branched out successfully into ending Roundup use by the Borough government. We have also educated citizens through the Sierra Club Youth Corps’s work on killing weeds in sidewalks without toxic chemicals. In implementing community education, we organize two community picnics in the summer and cosponsored an environmental film festival at West Chester University in the fall of 2017. We have big plans for events in 2018. We are in agreement with the large and growing body of research showing that spraying airborne pesticides for mosquito control poses serious threats to the environment and human health and is the least effective form of mosquito control. We favor non-toxic measures, such as larviciding and reducing mosquito breeding sites by education of residents. We are following the lead of many communities across the nation that have banned spraying for mosquitoes, some more than 15 years ago, with no adverse human health consequences. The resolution in Lyndhurst OH and the plan in Shaker Heights OH have inspired our work here in Chester County PA. We are also following the lead of the state of California in warning people about the dangers of RoundUp/glysophate. Young people are interested and involved in all these efforts and the Sierra Club is an essential national leader. Our very recognizable signs have been very successful in getting out our message, with about 350 in place across the County during the mosquito season. We urge all municipalities to examine these issues, to create detailed plans to control mosquitoes without spray, and thus to protect residents and the environment. The city of Portsmouth claims it’s too expensive to kill sidewalk weeds in a way that doesn’t endanger our health. I disagree. For decades American society has had a substance that could be sprayed on properties to decrease homeowners’ chances of contracting a mosquito-borne illness. However, this substance has met controversy as it could have long lasting negative effects on your health and other living beings, such as: bees, butterflies, dragonflies, cats, frogs, small children and hyper-allergic individuals. Given that risk, some argue that we shouldn’t spray. Don’t Spray Me is an organization in Chester County that fights to stop the use of dangerous pesticides; instead, they educate the community on safer and more effective means of controlling mosquitoes. Throughout the Borough of West Chester, their lawn signage can be seen. It features a cartoon baby in a gas mask. When looking for a logo, Founder Margaret Hudgings wanted to find something that represented the dangers pesticide spraying had on children, so she searched Google Images for “baby in gas mask” and that image popped up. They got permission from Slovenian artist Daniel Ferencak to use his work, and that is how the baby in the gas mask came about. Pesticide spraying can be life threatening. These pesticides have been linked with Autism, ADHD, Parkinsons and other kinds of cancers. Hudgings lost her son, Graham, to multiple chemical sensitivity due to spraying. “My son died five months ago after being sick for over 20 years from exposure to pesticide spraying,” said Hudgings. This has been a huge motivation for her and she is passionate about educating others…. Win a $100 voucher toward Food Co-op membership! 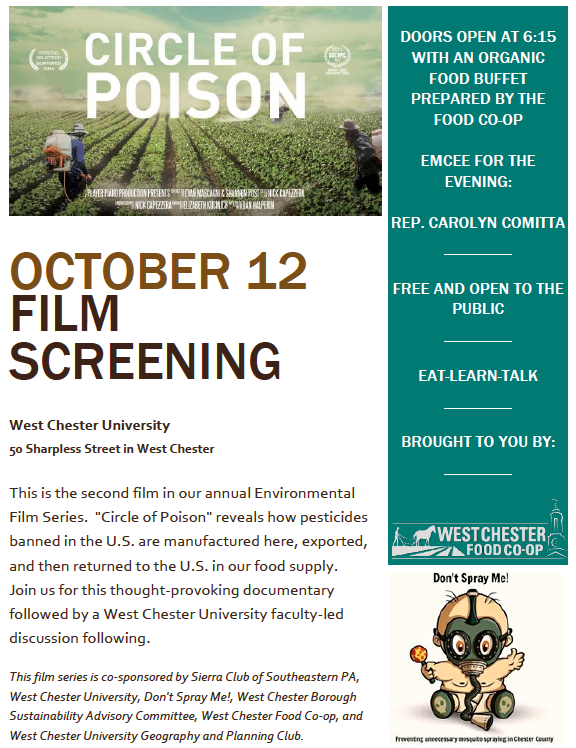 At the multi-sponsored environmental film showing on Oct. 12, DSM will raffle off a $100 voucher toward membership in our good ally the West Chester Food Co-op. The raffle will be held at October 12 film screening. Tickets $2 ea or 3 for $5 will be available before the film. If you win and can’t use the $100 credit, you can give it to someone else: a nice present for a food-minded friend or relative! 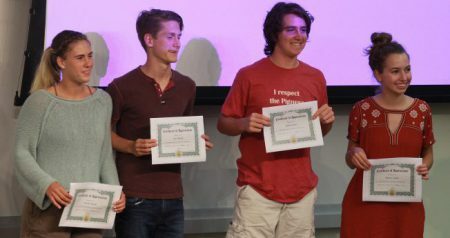 “Unacceptable Levels” (which should lead us all to scrutinize anew the pesticide residues in what we eat, drink, and breathe) was shown on Sept. 14, 2017, sponsored by the Sierra Club, Don’t Spray Me!, the WCU Sustainability Program, the WCU Geography & Planning Club, and 4CP, in memory of Graham Hudgings.